Choosing the right outsourcing partner can be one of the most difficult tasks that organizations face today. When your organization has to select a sourcing partner for IT, ITES or BPO services, first define the final result and your expectations of the outsourcing relationship. Clearly defining what you want can go a long way in helping you choose the right outsourcing partner. Before choosing an outsource partner, ask the following questions. Does the selected offshore partner have experience in the particular service that you want to outsource? Has your selected outsourcing service provider been able to provide quality services to other companies like yours? Does your chosen business partner use the best in technology, software and infrastructure? Does your outsourcing provider have experienced, trained and qualified professionals that can efficiently handle your projects? 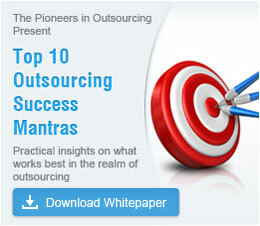 Asking yourself some of these questions can help you choose the right outsourcing partner. The following are some tips on choosing the right outsourcing partner. These tips can help you ensure that you find the best offshore partner for your business. Find out more about the experience of your outsource partner, the different kinds of customers that they have provided services for and the number of projects that they have completed. Find out if your offshore partner has experience in delivering the required services at the scale of your business needs. This can help you analyze if the particular outsourcing service provider is best suited for your business. Before finalizing on an outsource partner ask for references from your offshore partner. From references you can find out more about the quality of service, timely deliveries and customer support services. By contacting the customers of your outsourcing partner, you can find out more about the abilities of your outsourcing partner. You will also be able to get more information about issues such as, responsibility and turnaround time. Talking to the customers of your outsourcing provider can give you first hand information about whether the outsourcing relationship between you and the selected outsourcing partner would work. Another important factor to check while choosing the right outsourcing partner would be to check if your business aims and the business objectives of your outsourcing partner match with each other. Tell your business partner more about your business objectives and ensure that your chosen outsource partner understands them. Understanding your outsourcing partner's objectives can help you decide if that particular offshore partner is right for your business. Make sure that your outsource partner is financially secure, as this is a critical factor in outsourcing. You could also find out more about the outsourcing service provider's directors and managers, their experience and their qualification. Geared with such detailed information, you will be able to analyze if a particular outsourcing service provider can match up to your expectations. When choosing the right outsourcing partner make certain that you and your outsource partner are culturally compatible. Make sure that your business partner understands your organization and your employees. Getting access to your outsourcing partner's samples can help you better understand if the selected outsource partner matches up to your expectations. Samples would also give you a good idea about your IT partner's capabilities, technical expertise and level of quality. After verifying these samples, if you have doubts about whether your project can be done, ask your outsourcing partner for a prototype. This will enable you to make certain that your outsourcing partner understands your business objectives and if they have the right processes, technology and people to handle your project. Ensure that the outsource partner that you choose speaks your language. Finding an outsource partner who can understand your language and communicate with you efficiently can help you understand their business objectives. Good communication can assure you about the outsourcing relationship. Before stepping into outsourcing, ensure that your outsourcing partner is accessible on a 24x7x365 days basis on instant messenger, phone and email amongst others. This way you will be able to constantly communicate with your offshore partner. Before finalizing on an outsourcing partner, find out if your partner would provide your organization with support services, after the completion of a project. Post development support from your partner can help you resolve any issues that you might be having after your project has been implemented. Visit your outsourcing partner's workplace and find out if your outsourcing partner uses best-of-breed infrastructure and high-end technology. Visiting your outsourcing service provider can help you analyze if your offshore partner has the right equipment to handle your project. Visiting your outsource partner can also help you to better understand their processes, methodologies and team amongst others. Outsource2india, a leading outsourced services provider, has put in place an effective business model, a fact borne out by the organization's world-class service delivery to its global clientele. Our customers, across a range of verticals, have benefited from increased productivity, sales, customer satisfaction, business value and lower cost. Outsource2india's services include Call Center Services, Data Entry Services, Engineering Services, Healthcare BPO, Finance and Accounting Services, Software Development, Research and Analysis Services, Photo Editing Services, Creative Design and Web-analytics Services. Choose Outsource2india today! Get the best outsourcing partner for all your business requirements.